Like his narrator in The Man Who Loved Dogs , Leonardo Padura has been made to matter less than he should. For some time, Cuban writer Leonardo Padura has been exploring his disenchantment with many of the realities of his beloved county through his novels about detective Mario Conde. But it is in his The Man Who Loved Dogs, just published in English, where his social and political reflections about socialism and freedom — in Cuba and beyond — reach their greatest depth. Padura intertwines the stories of Russian revolutionary Leon Trotsky and his assassin, the Catalonian Communist Ramón Mercader, whom he brings together through the lens of a Cuban narrator, a journalist fired from his job for political reasons and forced to work as a proofreader for a veterinary journal. The historical fact that, for about four years at the end of the seventies, Mercader lived in Cuba, working as an adviser to the repressive Ministry of the Interior (and that his mother Caridad worked for seven years as the functionary in charge of public relations at the Cuban embassy in Paris in the sixties), gives Padura the means to connect the assassin with the journalist. They meet one day when Mercader, accompanied by a bodyguard, is walking his beloved dogs on the beach of Santa María del Mar where the journalist had gone to watch the sunset. Without exposing his identity, Mercader reveals much of his life to the Cuban journalist, pretending that he is talking about a third person and not about himself. And it is through this artistic convention that Padura articulates his ideas about Stalinism, its psychology and horrors, as much in the sphere of high politics as at the level of the individual. Contrary to the stereotype of robot-like Communists, Padura presents a nuanced view of a range of Communist personalities. In spite of the crushing weight of ideological orthodoxy and terror, Mercader’s individuality remains. It is further eroded when, after having been recruited by Soviet intelligence officers, his superior officer informs him in the middle of the Civil War that Stalin himself has ordered a purge of the Republican command loyal to the Socialist president Largo Caballero. With this Padura also challenges one of the many myths regarding the role of the Communist Party and the USSR as saviors of the Spanish Republic that still prevail through much of the international left. 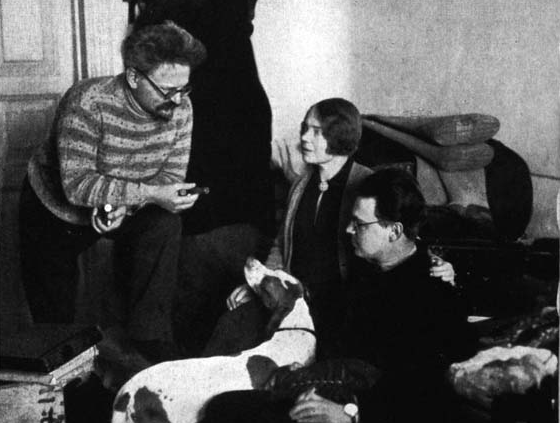 The other committed Communist in Padura’s novel is Trotsky, a man who also loved dogs. With deep knowledge and understanding of the work of the Bolshevik leader, the Cuban writer describes him with genuine sympathy: lost in exile, deprived of Soviet citizenship, and unable to find asylum in any country until Mexican president Lázaro Cárdenas gives him shelter in Mexico. Grasping that loneliness allows Padura to describe a Trotsky that is not surprised by the preposterous confessions extracted from the victims of the great purges of the thirties in the USSR, but who is greatly saddened by the self-inculpatory confession of Christian Rakovsky, his old comrade in the struggle against Stalin, at the third Moscow trial in 1938. Prodded by his sympathy for the Russian leader, Padura shows Trotsky reproaching himself internally for not having acknowledged the excesses he himself incurred in trying to defend the survival of the revolution, “although he would never publicly admit it,” avers the author. The Trotsky imagined by Padura laments the actions he took to militarize the railroad unions and the coercive policies applied during the post-Civil War reconstruction, the replacement of union leaders, and even his role in the bloody crushing of the Kronstadt revolt. These are plausible, though perhaps excessive, speculations by Padura in light of the revisions that Trotsky made during the thirties of many of the political ideas that he had adopted particularly during the Civil War of 1918-20 — revisions that made him reject, for example, the principle of the single party as a keystone of socialism in power. At the same time, these may well be the projections of Padura retrospectively reflecting about how a similar system was implanted in his own country. Padura, living under Cuba’s sort of Communism, also highlights Trotsky as a literary critic who affirms, without hesitation, that “everything is permitted in art.” Not accidentally, the Cuban writer singles out the occasion when André Breton, on his visit to Mexico, tells Trotsky that everything is permitted in art except attacks on the proletarian revolution. Trotsky replies that in art no restriction can be allowed — that there is nothing that a dictatorship should ever impose on the creator under the excuse of historic and political necessity, and that art must abide by its own demands only. With as much sympathy and respect for historical truth as he treats Trotsky, it would be a great mistake to see Padura as sympathizing with Trotskyism. Without detracting from Padura’s remarkable achievement in portraying not only Trotsky the man but also Trotsky the political thinker, he fails to grasp, perhaps because of his own political background, certain strategic concepts of Trotsky’s thought. Padura accurately presents Trotsky’s harsh critique of German Communism and its suicidal policy towards Nazism that treated social democracy (“social fascism,” according to the language of the Stalinists) as equivalent to Nazism. But he mistakenly implies that the “old man” advocated a sort of popular front of all “center and left” forces to combat Nazism and Fascism. Instead, echoing the Comintern of the early twenties, Trotsky proposed a United Front policy that would bring together all the working-class forces, which included social democracy but excluded the bourgeois parties regardless of how liberal and democratic they were. In other words, Trotsky supported a class politics, not “popular” politics. He supposed, as in the case of Spain, that opposition to Fascism could only succeed if it was based on the mobilization of class interests, which ultimately would lead to socialist revolution — the only real alternative to Fascism for Trotsky, given the decay of capitalist society even in its democratic versions. Whatever doubt may have remained about Padura’s possible Trotskyist inclinations was removed by his recent interview with Espacio Laical , the Cuban Catholic liberal publication, where he said that Trotsky had been as much a “fanatic” as Mercader — a statement that seems completely at odds with the spirit and letter of The Man Who Loved Dogs . Yet the main character in The Man Who Loved Dogs is neither Leon Trotsky nor Ramón Mercader. It is the only figure in the plot that is totally fictitious, the only one of the three who is Cuban: the narrator himself. Iván is a young journalist who has already been punished by the system twice for being too independent by the time he meets Mercader. Shortly after having graduated from the university, state authorities sent him to the far-flung town of Baracoa to work as chief of the local radio station — an action intended to serve as a “corrective” by the Cuban government to “bring me down and place me squarely in this world.” The second time he was sent to work for a veterinary journal as proofreader. Then, to add to his professional misfortunes, his brother gets excluded from the university for being gay and disappears when trying to flee to the United States. Iván’s personal story begins to take place in the seventies, a time period that marks the four years that Mercader resided in Cuba as an adviser to the Ministry of Interior as well as the high point of the political and cultural repression and Stalinism on the island. I think that in those years we must have been the only members of our generation in the whole of Western student civilization who, for example, never put a joint between their lips and who, despite the heat running through our veins, would belatedly free ourselves from sexual atavism, led by the damned taboo of virginity (there is nothing closer to communist morality than Catholic precepts); in the Spanish Caribbean we were the only ones who lived without knowing that salsa music was being born or that the Beatles (the Rolling Stones and Mamas and the Papas too) were the symbols of rebellion and not of imperialist culture, as we were told so many times; and besides . . . we had been at the time, the least informed about the extent of the physical and philosophical wounds produced by Prague by tanks that acted as more than threats, about the massacre of students in a Mexican plaza called Tlatelolco, about the historic and human devastation unleashed by our dear Comrade Mao’s Cultural Revolution, and about the birth, for people of our age, of another kind of dream, killed in the streets of Paris and in the rock concerts in California. Then, situating himself in the nineties, Iván revisits the birth and death of the hopes raised by Perestroika, the discovery of the truth about the Romanian dictator Nicolae Ceaucescu, the horrors of the Cultural Revolution in China, and the disappointment upon having discovered that the great dream of human emancipation and equality was deathly ill, and that genocides like the one committed in Cambodia by Pol Pot’s Khmer Rouge regime had been committed in its name. What appeared indestructible had broken apart at the seams. Leonardo Padura, is one of the principal representatives of a new intellectual and cultural ambience in the island that support the liberalization and democratization of Cuban society. But he is in a unique position in the Cuban system: though tolerated and even feted, his most critical work has not been made available to the broad public. He seems to have achieved a much greater degree of independence from the authorities than other well-known artists and intellectuals in the island. Thus, he has critically supported the reform program of Raúl Castro’s government, but he has acted with much more independence from the regime than other well-known Cuban artists and intellectuals — for example, abstaining from endorsing many of the statements denouncing dissidents sponsored by the cultural apparatus of the Cuban state. As Padura himself has suggested on various occasions, this has been possible in part because of the economic independence from the government that he has achieved with the publication of his works abroad. Fifteen years later, with the USSR dead and buried, says the Cuban novelist, he told the history of Trotsky’s murder “to reflect on how the twentieth century’s great utopia was corrupted.” Shamefully, after being published and favorably reviewed by the official press in the island, and even though he received the National Prize for Literature in 2012, the print-run of his book’s Cuban edition was so small that it was unavailable soon after its public presentation. The Cuban government wants to have its cake and eat it too: to relax some political controls and at the same time prevent the spread of ideas that may subvert its monopoly of power. Padura hasn’t been censored or repressed by the Cuban government. But similar to his narrator Iván, he has been made to matter much less than he should. A version of this article appeared in Spanish in Nueva Sociedad.